CEED 2018 (डिजाइन के लिए आम प्रवेश परीक्षा): The Indian Institute of Technology Bombay conducts Common Entrance Examination for Design on behalf of Ministry of Human Resource Development. The students seeking admissions in M.Des and PhD programs can apply for the CEED 2018 Application Form. The forms will be released on 9th October and end on 10th November 2017. The students need to submit the form before the due date to take part in CEED Admission 2018 procedure. The students have to submit the CEED 2018 Registration on the official website. The last date for the submission along with the late fees is 17th November. The students have to submit the form successfully to appear in the entrance exam. We have provided a direct link for the submission of the CEED online Application Form. They just have to follow some precise procedure for the submission of the form. 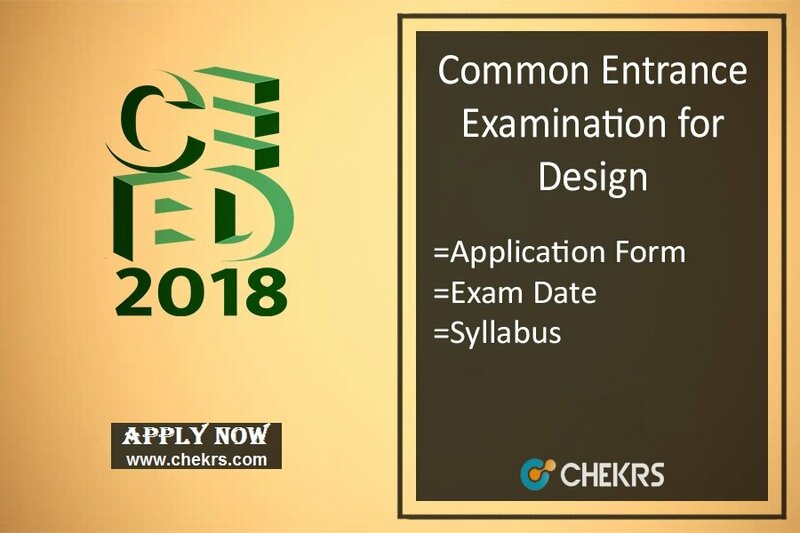 Steps to submit CEED Exam Form 2018. Then they have to click on the register button. Start filling the application form with your correct details carefully. Now attach the scanned copy of the documents, photograph and signature along with the form in a prescribed size. The students have to pay the required application fee. The fee will be paid only via online banking modes. The fee for the application is non-refundable. The aspirants need to check the CEED Eligibility 2018 before applying for the application form. There is no age limit for the CEED 2018 Exam. The aspirant must have completed Diploma/ Degree/ Post Graduate Degree or GD Arts Diploma Program from a recognized University. They must have score minimum 60% marks in their Qualifying Exam. There is no limit to appear in the entrance exam. Number of Exams: Two papers will be conducted for the CEED Exam. The student who will qualify the Part A Exam only they will get eligible for Part B. Negative Marking: .6 Marks will be deducted for the 1st and 3rd section of Part A.
Pictorial and diagrammatic questions to test the understanding of transformation and/or manipulation of 2D shapes and 3D objects and their spatial relationships. General awareness of environmental factors such as climate, population, water, vegetation, pollution, weather, natural resources etc., and their implications on the design of products, images, infrastructure and environment. Awareness of design terminologies, social and rural connection with the design, history of the designed artefact, and socially responsible and environmentally sustainable design responses. History of art, sculpture and literature. Ability to detect concealed properties in the day to day life and think critically about them. Ability to discern subtle differences in visual properties and aesthetic outcomes.